eBay is no stranger to running regular sales and discounts, often slashing 10% to 20% off everything sold on its site. 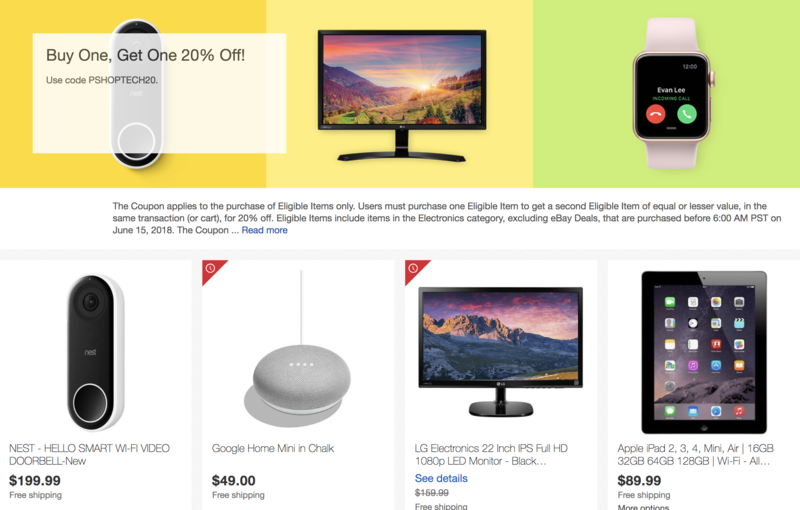 Right now, eBay is selling products in the electronics category with a 'buy one, get one 20% off' promotion, and there are a few decent deals to take advantage of. Though not as enticing as a direct 20% discount, the promotion still ends up saving shoppers the equivalent to 10% when buying a pair of items. Purchasing two identical products may not make a lot of sense in some cases (you probably don't really need two copies of Call of Duty for your Xbox), but the deal sounds a lot more attractive for something like a pair of Sonos Play:1 speakers, which will come out to $30 cheaper than their regular price ($268.20 instead of $298). If you happen to live in a home with more than one entrance, you could also consider grabbing a pair of Nest Hello smart doorbells for $360, instead of $400. The promotion runs until June 15 at 6:00 am PST (roughly 13 hours from now as of this writing) and only applies to items in the electronics category, excluding eBay Deals. The discount is also capped at a maximum value of $200, so items worth more than $1000 each won't bring in any increased savings. It can also only be applied once per account. If you're interested in browsing the items available, head to the promotion's webpage to see if anything catches your eye, and don't forget to apply the coupon code PSHOPTECH20 on checkout.